Australia's vastness and diversity cannot be covered in just a few days. Be prepared for long distances from one major city to another – in fact from almost anywhere to anywhere else. From Brisbane northwards up the Queensland coast to Cairns is as far as from Paris to Naples; from Melbourne to Perth is further than from London to Moscow, while a rail journey from Brisbane to Perth is further and takes longer than one from New York to Los Angeles. To explore the whole rail network of Australia – or rather those parts of it served by regular passenger trains – would take a minimum of 50 days' almost non-stop travel. 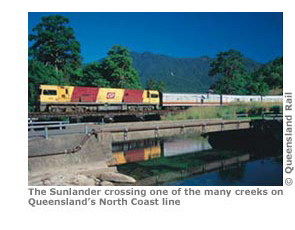 Even then you would not cover the privately-operated preserved and narrow-gauge lines either on the mainland or in Tasmania, or the Normanton railway in the Crocodile Dundee gulf country of the far north. The main routes join the cities of Sydney, Melbourne, Brisbane, Adelaide, Perth and Darwin. As far as passenger trains are concerned there is only one route between Brisbane and Sydney, two between Sydney and Adelaide, one of which is via Melbourne, and one between Adelaide and Perth or Darwin. These trains, along with others are described on pp35-59. In Part 5 the various routes are described as the traveller might see them. In Thomas Cook's European Timetable a list is given of the most scenic rail journeys in Europe, based largely on research by the late John Price, former managing editor of Cook's Timetables. Scenic appreciation is partly an individual matter but not entirely so; there is a consensus about what is attractive, as evidenced by calendars, picture postcards, colour slide sales and the facts of where people go, where they stay and what they gasp about and take photographs of. My own list (pp34-5) of the most scenically-interesting or unusual routes served by regular or occasional (eg special excursion) passenger trains may help tourists plan an itinerary if scenery is what they most seek. Timetable changes and bus substitutions in recent years in nearly all states have deprived rail travellers of much potentially attractive or dramatic scenery or confined it to periods of travelling in darkness, but sometimes because of late running, diversions or special excursions, there is a chance to discover and enjoy otherwise hidden panoramas. The Thomas Cook European scenic rail list includes information on the type of scenery found on each route, ie coastal, forest, gorge, lake, mountain or river, or a combination of any or all of these. This has not been attempted for Australia because the scenery is in many ways so different. The sheer overwhelming nothingness of the Nullarbor, for example, does not fall into any of the foregoing categories, yet it cannot by any criterion be omitted. It has its own unique attraction. Coastal scenery is rare on the railways of Australia. In terms of conventional scenic values, it might be said that the routes through the Great Dividing Range, combining mountain, forest, gorge and sometimes river scenery are the most attractive but how do you classify the wonderful sedgeland around Cromarty in Queensland with its teeming flocks of Burdekin ducks, brolgas and other birdlife? The eye of the beholder will determine what appeals. The suggested list can only offer ideas. Some scenic areas are hard to access, involving long journeys away from population centres, but others are virtually on the doorstep of a city. It should be noted that the scenic sections in suburban Sydney – North Sydney to Wynyard, the Illawarra route south of Waterfall, and the Blue Mountains (Penrith-Lithgow) – are readily accessible and can easily be included in almost any itinerary focused on or including the Greater Sydney area. An asterisk (*) indicates a route on which no scheduled services operate but for which special excursions might be advertised. For further details of routes with no page reference contact ARHS, see p254.